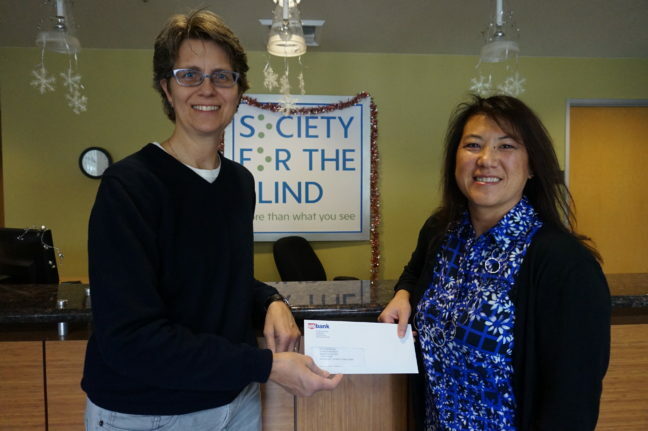 US Bank recently gave $20,000 to Society for the Blind in Sacramento to help fund its job-readiness programs for youth and adults with low or no vision. “The unemployment rate is 70 percent for people with vision loss, so we are especially grateful to US Bank for acknowledging this gap and helping to fund our programs that will help youth and adults with low or no vision land good jobs,” said Shari Roeseler, executive director, Society for the Blind. Society for the Blind’s job-readiness programs assist transition-age youth and working-age adults in career planning, setting and meeting educational goals, job placement and coaching. Programs include job exploration counseling and work-based learning experiences. Participants with little or no work experience learn workplace readiness skills and are placed in internships prior to career exploration. For more than 60 years, Society for the Blind has created innovative ways to empower individuals living with low vision or blindness to discover, develop and achieve their full potential. Society for the Blind has grown from a dedicated group of volunteers that included the Lions Clubs of America to a nationally recognized agency and the only comprehensive rehabilitative teaching center that provides services for a 27-county region of northern California. The nonprofit provides low-vision eye care, life and job skills training, mentorship, and access to tools to maintain independence for 6,000 youth, adults and seniors experiencing vision loss each year. For more information or to make a donation, visit www.SocietyfortheBlind.org.